The Auschwitz Institute for Peace and Reconciliation (AIPR) is proud to announce that Owen Pell has been selected as President of our Board of Directors. Following the recent passing of AIPR’s beloved Founder and original Board President, Mr. Fred Schwartz, the Board of Directors moved unanimously to appoint Mr. Pell to the position. A longtime friend and colleague of Mr. Schwartz and the Auschwitz Institute, Mr. Pell first joined the organization’s Board of Directors in early 2014, after having supported AIPR’s efforts for several years. 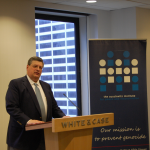 White & Case LLP, an international law firm at which Mr. Pell serves as a Partner, has also generously contributed to the Auschwitz Institute’s work through numerous collaborative projects and pro-bono services. Mr. Pell is an active contributor to the field of genocide and mass atrocity prevention. He has a wealth of practical experience in dealing with international reparations and restitution claims, having participated in several high-profile negotiations. Furthermore, Mr. Pell has published numerous academic articles on reparations processes as well as contributing to the recent publication of Reconstructing Atrocity Prevention, with a chapter on the intersection of corporate behavior and the prevention of mass atrocities.